I’ve written (many, many times) about how the best way to help the poor is to focus on economic growth rather than inequality. After all, in a genuine market economy (as opposed to socialism, cronyism, or some other form of statism), the poor aren’t poor because some people are rich. Today, let’s look at a real-world example of why it is a mistake to focus on inequality. This paper investigates the influences of the income overlap part on the nationwide Gini coefficient. 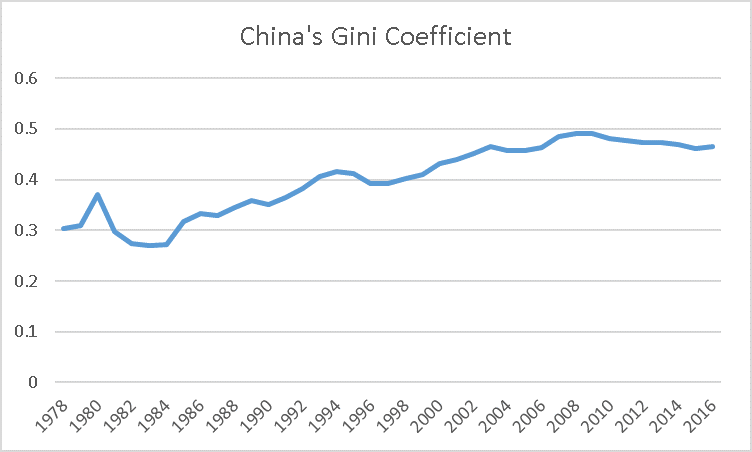 Then we present a new approach to estimating the Chinese Gini ratio from 1978 to 2006, which avoids the shortcomings of current data sources. In line with the results, the authors further probe the trend of Chinese income disparity. …income inequality has been rising in China. …the national Gini ratio of 2006 is 1.52 times more than that of 1978. Here’s a chart based on their data (combined with post-2006 data from Statista). It looks at historical trends for the Gini coefficient (a value of “1” is absolute inequality, with one person accumulating all the income in a society, whereas a value of “0” is absolute equality, with everyone having the same level of income. 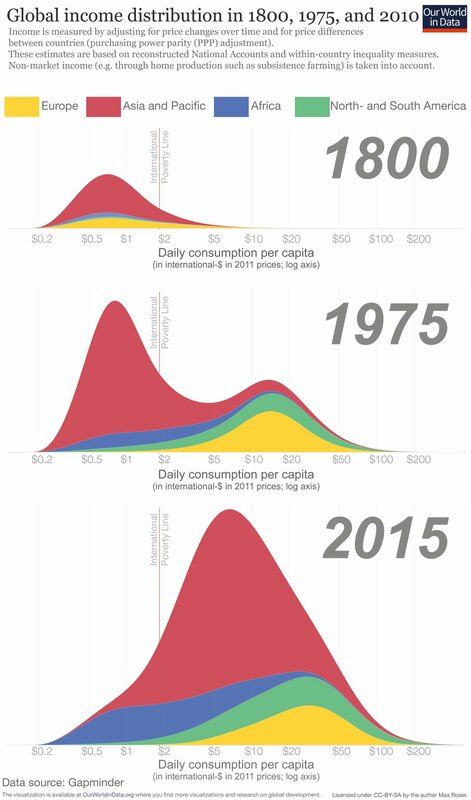 As you can see, there’s been a significant increase in inequality. My response (beyond pointing out that the economy is not a fixed pie), is to argue that the goal should be economic growth and poverty reduction. I don’t care if Bill Gates is getting richer at a faster rate than a poor person. I just want a society where everyone has the chance to climb the economic ladder. But I’m digressing. The main goal of today’s column is to look at the inequality data from above and then add the following data on poverty reduction. Here’s a chart I shared back in March. As you can see, there’s been a very impressive reduction in the number of people suffering severe deprivation in rural China (where incomes historically have been lowest). *To the extend that some upper-income taxpayers obtain unearned income via government intervention, then they may lose out from economic liberalization. Ethical rich people, however, will earn more income if there are pro-growth reforms. Very educative for such a person like me heads a think tank in Uganda.I need more of these articles and insight about free market economy. Dan, please post the wealth and income Gini coefficient for both the U.S. and China if you want to compare their system and ours. 87% of China’s wealth is in the hands of the few at the top. We are quickly approaching China with 75% in the hands of the top 10% which equates to a shrinking 90%. To explain, imagine individual tax rates of 1% on net worth and 18% on income (with no 15.3% payroll taxes). Any taxpayer could elect to reduce one tax rate by raising the other – (inverse taxation). For example, the wealth tax could be reduced to zero by increasing the income rate to 28%. In the other direction, the income tax rate could be reduced to 8% by increasing the wealth tax to 2%. A $500,000 individual wealth tax exemption for retirement, health care and education savings would encourage most to elect the 2% wealth tax and 8% income tax rate. Billionaires would tend to elect no wealth taxes but for an additional rule that permits wealth taxes paid over a lifetime to be a credit against the Estate Tax. A low 4% VAT and 8% C corporation tax would complement the individual reforms. Next imagine a government that helped families gradually save a million dollars over a lifetime and let multimillionaires fend for themselves. No more crony capitalism. And, what has happened to all the concentrated wealth that individuals accumulated through time? It is a puzzlement. Take the Pharaohs. They built pyramids that now pay off big-time as magnates for the tourist trade. Museums charge to display their wealth. Wealth can’t help but become “redistributed” benefits, until time itself renders them into dust and rubble. Same applies to the Carnegie, Rockefeller, Ford, and Gates/Buffet Foundations. The Clinton Foundation did the same, however, using public funds gleaned from political favors, tinged with corruption. In the end, “you can’t take it with you”. It is left to “others” to quarrel over, until “they” succumb to “death, or taxes”.